Relay for Life is coming up soon! Have you marked your calendar? Visit relayforlife.org to find the Charleston event. The Relay for Life website will prompt you to create an account with your email address. Once your account is created, click "Join a Team." Use the search field to locate our team (St. Andrews Parish UMC Love Not Fear). We hope that you will join us! If you have any questions, please see Deb Underwood or Hope Treadway. 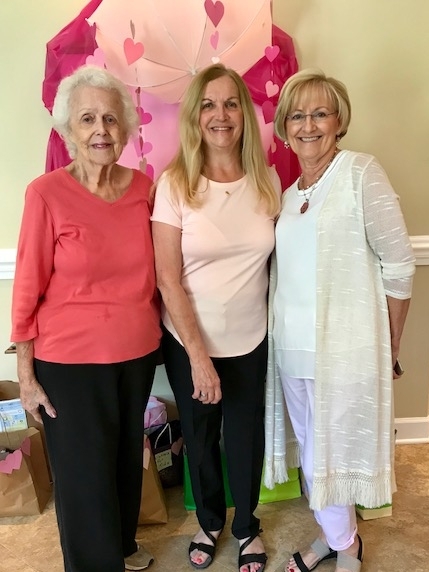 The United Methodist Women (UMW) of St. Andrews Parish UMC recently hosted a shower for Lowcountry Orphan Relief, and the event was an amazing success! SAPUMC, Grace UMC, Cokesbury UMC and Walmart contributed toiletries, clothing and plush animals in addition to cash donations (which totaled $242). Thank you to all who gave! The Tenebrae Service is at 8:00pm. A Prayer Vigil will begin after the Tenebrae Service and continue around the clock until Easter morning. We are excited to join forces with Cokesbury UMC for this year's Maundy Thursday Service and Good Friday Tenebrae Service. Please note that the Maundy Thursday service will be hosted at Cokesbury (4990 Dorchester Road in North Charleston). The Tenebrae service will be hosted in our sanctuary per usual (3225 Ashley River Road). All Holy Week events are open to the public. Please invite friends, family members, casual acquaintances and complete strangers... We look forward to celebrating the good news together! Please join us Sunday, March 11th at 5:30pm for a family-friendly worship night and potluck dinner. Our youth will be sharing a message, and representatives from our Relay for Life team will be present with 2018 event details. Our FAN committee will also be present to announce some new "Activity" initiatives at SAPUMC, including Relay Prep Walking/Running Groups. In the spirit of Faith, Activity and Nutrition, our FAN committee is challenging everyone to bring a healthy dish for the potluck. The best dish (delicious and healthy) will win a prize! This event is completely free and open to the public, but we do ask that you RSVP in advance to indicate if you will bring a dish. You can sign-up online or at church, on the bulletin board. Hope to see you there! Ash Wednesday is February 14th, and for the fourth year in a row, we will begin the Lenten season with Drive Thru Ashes in the church parking lot. Pastor Brad will have the Drive Thru open 7:00-9:00am. Please swing by on your way to work or school. Visitors will receive ashes and a quick prayer. Can't make it to the Drive Thru? Join us for our traditional Ash Wednesday service at 7:00pm in the church sanctuary. This initiative is just one of many ways in which our young people have chosen to embody "Fruit of the Spirit" (see the Focus on Youth section of our February newsletter for details). Our Music Director, Lavinia Parker, and Organist, Dr. Brad Parker, want you to experience the joys of music! The following music education opportunities require no prior experience and very little commitment. Each is designed with fun in mind! You've heard of pumping iron, but pumping bronze is way more fun! Join us for a musical workout, and learn the basics of handbell technique and note reading. Play along with familiar tunes, try multiple bell positions and master a fun piece in just two sessions! This clinic is completely free, and all are welcome! Please click below to RSVP. See what it is like to lead a worship service in song! This opportunity includes a 20 minute lesson with Lavinia and a shadowing session with Dr. Parker during an 11:15am worship service. Pull stops, play pedals, turn pages and even provide music for the service if you are so inclined. Interested parties should register online, and Lavinia will be in touch to schedule your lesson. Both services will feature a special message by Pastor Brad and his better half, Pastor Megan of Cokesbury UMC. The contemporary worship service will include musical selections by the SAPUMC Praise Band, and the traditional worship service will feature hymns. Both services are family friendly, and glow sticks will be available for the kids. All are welcome, and we hope to see you there! The Advocacy Committee of the Charleston District of the United Methodist Church is hosting a discussion Sunday, November 5th at Wesley United Methodist Church. This discussions is intended to be a respectful, productive and honest conversation about racial tensions and the things that damage the Body of Christ. This event is completely free and open to the public, but Wesley UMC has requested a head count to ensure that they are prepared. If you would like to join in this discussion, please email the church office to confirm interest. SCETV is hosting a screening event at SAPUMC for a new series, Yoga in Practice. The series and screening will be led by yoga instructor Stacey Milner-Collins of Columbia, SC. Attendees will have an opportunity to preview and practice along with an episode! Congregants and community members (ages 15 an older) are welcome to attend, but space is limited. Please click below for event details and preregistration information.